i would really appreciate your help on this topic: i don't need any UI, just if possible 1 click button that should be small fix after material conversion from VrayBlend to fR-Layer material. I use finalRender R3.5 engine and after materials conversion from VrayBlend to fR-Layer material, this is usual situation and you can see it in attachment. There are 9 layers but only few of them are filled with materials - 2 in this case, and the rest of them are empty. Since VrayBlendMtl does not have these checkboxes, I need small and fast script to check all fR-Layer materials in entire scene (Max 2012 and 2015) and activate only checkboxes for slots that have materials inside (layer 1 and layer 2 in this case), while checkboxes with "none" label on their slots should remain unchecked (layers 3-9). It would be perfect if this could work for fR-Layer materials in MultiSubs, also. 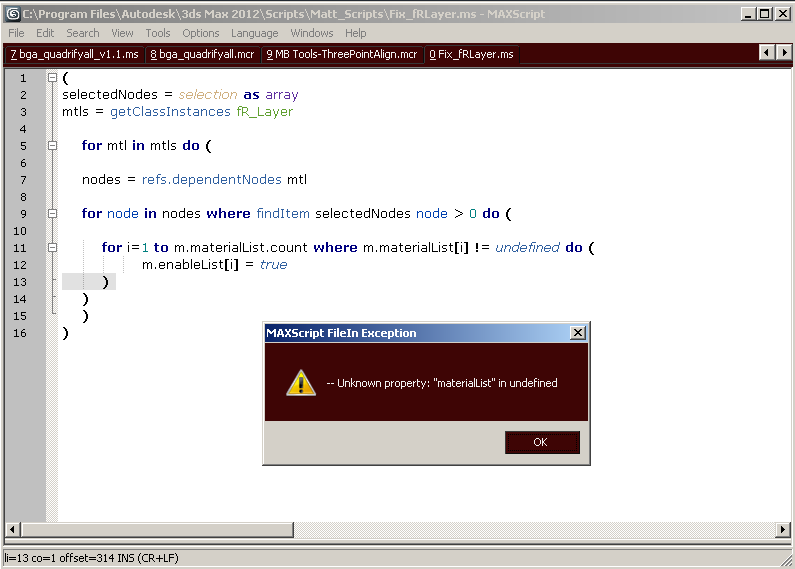 Just for your reference because i believe most of you don't have finalRender R3.5 installed, both checkboxes and material type slots are array type as you can see on attachment. Submitted by jahman on Wed, 2017-09-06 08:45. Submitted by igamaximus on Fri, 2017-09-08 05:37. Thank you once again Sergey, it works perfectly on entire scene! Submitted by jahman on Fri, 2017-09-08 06:42. Submitted by igamaximus on Fri, 2017-09-08 12:41. When i try with that code i get this message in attachemnt. Maybe it is not possible, and i can live with that, i will merge it in new scene as you told me. Thank you! Submitted by jahman on Fri, 2017-09-08 13:00. My bad. Change all m. to mtl. Submitted by igamaximus on Thu, 2017-09-14 01:25. Submitted by jahman on Thu, 2017-09-14 02:25. Submitted by igamaximus on Mon, 2018-10-08 02:08.
during usage, i just realized that it doesn't work if fR-Layer is nested inside of Multisub materials. Can you please include that part, if possible?? Submitted by jahman on Mon, 2018-10-08 02:19. Hi. Sorry, I have no fR installed so it is a mistery what could go wrong here. Submitted by igamaximus on Mon, 2018-10-08 03:39. Mate, i just realized it's finalRender UI glitch in material editor, it doesn't update in realtime, so although it shows it's not checked, it IS! I just have to select some other mat and then go back to this mat, and then i see everything works perfect!